I doubt any marketing team can perfect its SEO and content marketing efforts. Time, degrees of expertise, and changing algorithms always get in the way. But SEO misfires abound for B2B and B2C websites and they can be avoided or at least minimized. Keywords are probably the easiest SEO area to mess up. Aim too high for a competitive keyword phrase and you may never rank. Settle for low-hanging fruit and you might fall asleep while waiting for a rare visitor to make his or her way to your website. I tell everyone to focus on relevancy and the sweet spot. What’s a sweet spot with SEO? You can sense it when viewing rankings in Google’s monthly search engine volume. Try this: Do you tend to rank one to 10 on Google for keywords searched 300 times a month? Maybe 1,000? Get a feel for a variety of your pages. 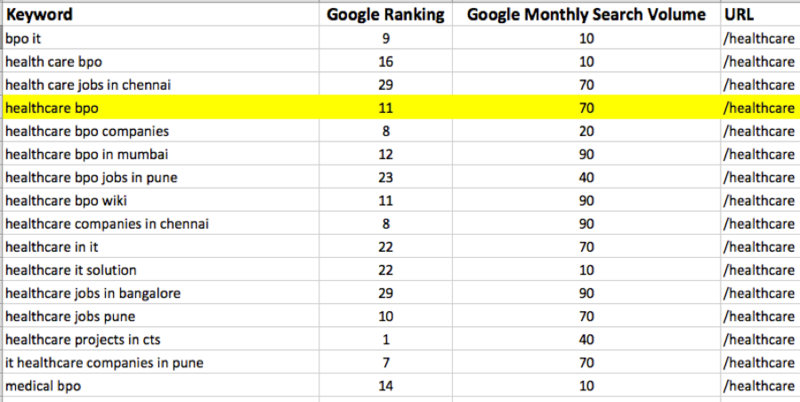 Your sweet spot is the correlation of top 10 rankings and the monthly search volume. Often, your sweet spot is more likely a range, such as 30 to 70, 200 to 500, or 1,200 to 1,500 searches for your one to 10 rankings. Don’t be dismayed if your site typically ranks well for a keyword phrase that attracts only 50 visits a month. Your products and services may have good price points and margins. In other words, you should be happy with even occasional sales that can more than pay for your SEO investment. And any website page that may rank for multiple keywords can always be working on your behalf. And the best part? With ongoing SEO, you could pursue more competitive keywords over time. Just don’t go after something with 3,000 searches a month when you can’t even rank for a keyword that has 100 searches each month. Your home page often supports tons of keywords because it has the most authority (backlinks). 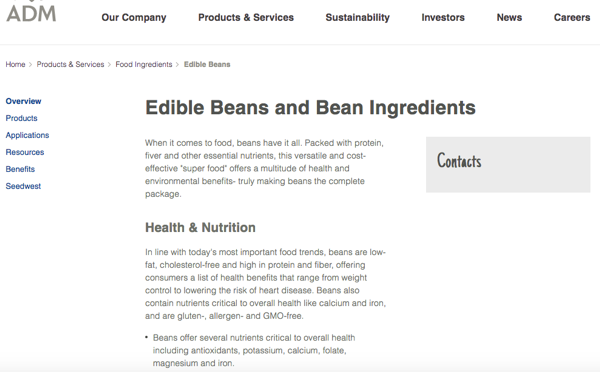 A keyword phrase may rank better if you optimize an interior page. 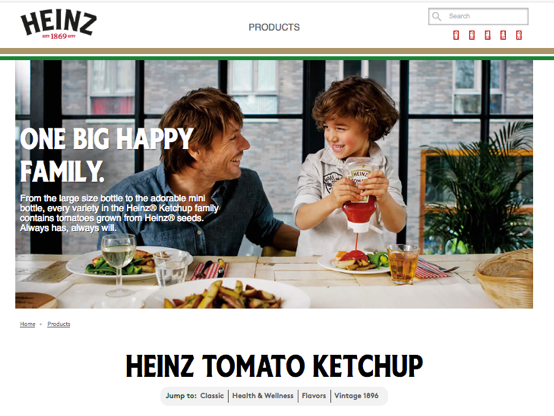 Heinz made a mistake because its ketchup page URL (http://www.heinz.com/products/heinztomatoketchup) doesn’t have a keyword – it’s jammed with characters and lacks dashes. A better (with a 301 redirect) page URL would be http://www.heinz.com/products/heinz-ketchup. The SEO page title needs help too. The page’s visible content could remain until the title and URL changes affect search engine rankings and updated a little after that. Search engines like Google want users to have a good experience. If people jump from your website right away and conduct another search, it could affect your rankings. Time spent on a page matters with SEO and content marketing. Generally, you want people to visit and make their way to other content pages. Unfortunately, those pages may not be well designed, may lack compelling content, or may switch visitors to a different language. 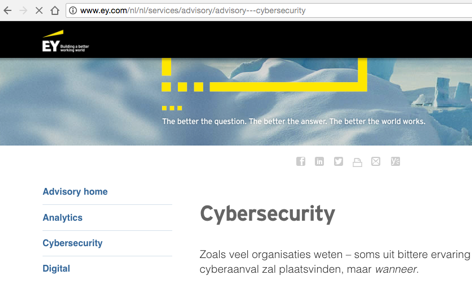 Ernst & Young takes visitors from English pages to the Netherlands (I wonder how often pages are reviewed by the marketing team). And, in a second, I flew across the pond. 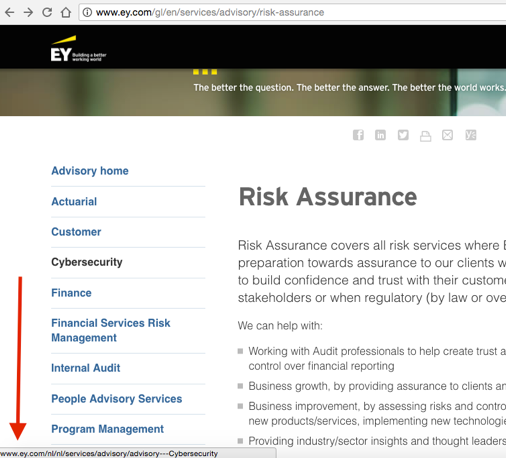 The conflicting language issue exists in part because thousands of Ernst & Young pages are indexed. I came across its English global version, which is indicated by the GL in the URL that I saw when checking the company’s ranking data. But it’s still odd that the language would change to the Netherlands – for cybersecurity and all other sections linked from the risk assurance and other pages within the global content. It’s best to use an H1 header tag with page content headers to identify important text. Unfortunately, headers often lack strategic keyword phrases. Citi has this page: http://www.citigroup.com/citi/about/citizenship/. The H1 is “global citizenship.” No one can do much with that in search. Or Cognizant has “business value of trust” as its H1 on this page: https://www.cognizant.com/business-value-of-trust. It’s important for SEO page titles to include relevant keyword phrases. But sometimes the words used by content marketers in the titles aren’t well represented in the content. Brands frequently mention their names in SEO page titles. Unfortunately, their inclusion limits the prominence of the remaining keywords. And sometimes the same words are repeated. Too often marketers ignore the alt text and don’t include a short description for search engines. Make sure the code doesn’t show an empty alt=“” attribute. Search engines consider your internal links and not just the ones in your primary navigation. Look for ways to use links to connect your relevant pages. If you have paragraph after paragraph, why wouldn’t you include an internal link in the text to guide a visitor to your other content? It would be silly to put in motion SEO tactics for higher rankings and traffic if the content fails on the call-to-action front. But it happens all the time. SEO should be part of a holistic content marketing strategy. 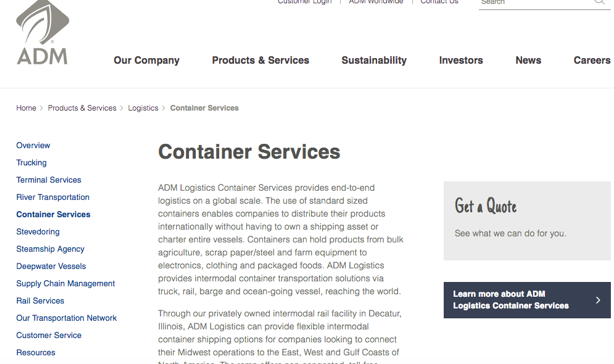 ADM falls short left and right with calls to action. I found numerous pages that tease visitors with “Get a quote: See what we can do for you.” But the words don’t link to anything. In this example, it includes the word “contacts” in the right side, but whom to contact is a mystery. At least ADM includes a phone number on some pages. But too many companies do not. Why wait until the bottom of content to mention the phone number? Find a way to feature it higher in the text, a separate box, etc. Even in this case, the phone number could have been emphasized better by bolding it or using a different color – or doing both. Track broken links on your website. They can be created because of typos or content deleted without a 301 redirect. In a small way, broken links can make a poor impression on search engines and prompt users to go elsewhere. 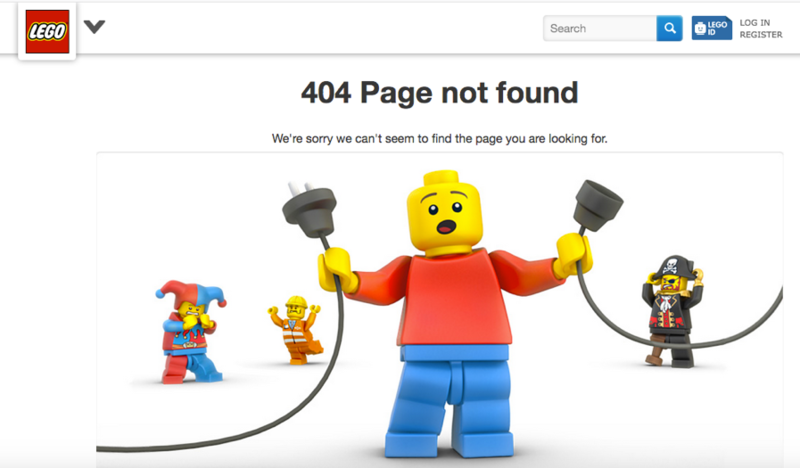 Given that broken links are inevitable, you should have a custom 404 page that guides visitors to relevant content and popular pages you don’t want them to miss. 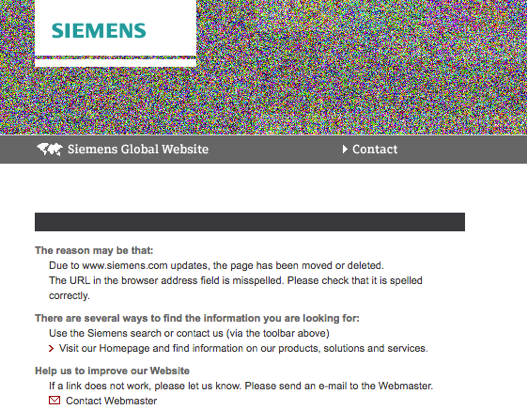 Siemens doesn’t exactly go out if its way to help anyone. Everyone wants to get backlinks from other websites to help achieve higher search engine rankings (search engines reward quality links from other websites). But watch out for questionable links that just come your way even if you don’t seek them. Moz and SEMrush have tools to help you find the lousy ones. Use the disavow option in Google Search Console to report them so they won’t hurt your backlink profile. 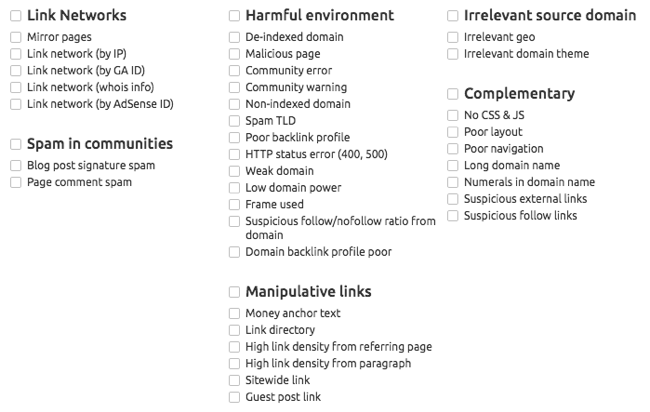 Check out this collection of indicators for backlinks SEMrush calls toxic. I encourage companies to use keyword phrases in their page URLs. But keep them short – maybe three to five words. Anything longer looks spammy and could detract from the keywords you’re targeting. Keep in mind that large websites can often overlook SEO best practices and rank well anyway. Backlinks, website age, etc., help them overcome any defects. For example, Lowes ranks No. 2 for “gas grills” on Google even though “grills” is used three times in a row. It still helps to have a keyword in the domain name, but you need to leverage other tactics and opportunities to make the most of it. But it should work harder to align URLs with SEO page titles, content headers, and the overall content. Let’s explore one of its pages. It looks good at first glance. But “intelligence” isn’t anywhere in the content. I like the SEO page title (but I would tweak it). Shipping keywords may rank higher if ShipHawk changes its SEO title and page URL while keeping “shipping,” which is reinforced by the domain name. Over the years, I’ve seen many websites appear to have duplicate content even though they have only one set of content pages. Often, one URL includes “www” and another URL does not but they both go to the same page. For example, I might start with www.misfiresdomainexample.com. 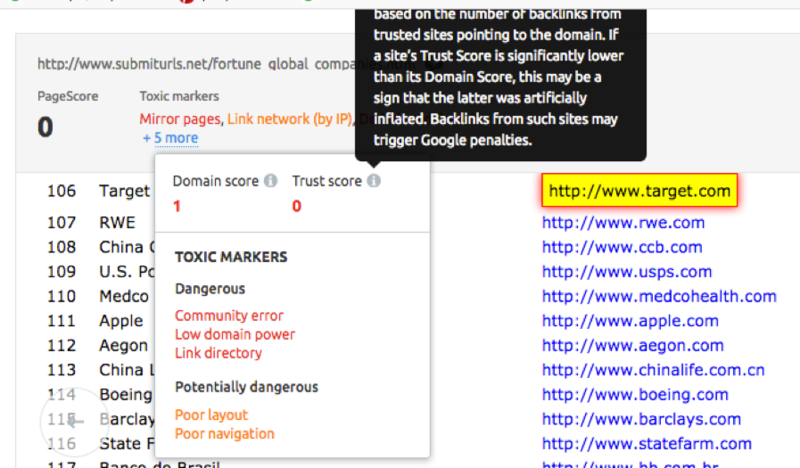 But I shouldn’t go to misfiresdomainexample.com and see the same pages without the www. Search engines could reasonably think someone is trying to game them – creating two websites to get extra rankings. If you haven’t done it, you should consider moving your website to HTTPS from HTTP. Google has been pushing the more secured connection. It’s possible your site might get a slight edge with rankings. But even if you don’t, appearances are everything. For example, Google Chrome calls out websites as not secure when they lack the basic security feature known as SSL (Secure Sockets Layer). 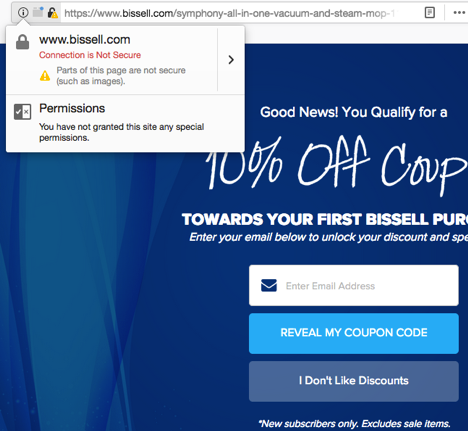 Bissell attempted to use HTTPS, but it still gets the dreaded security alert on Google because some page elements aren’t secure. Don’t settle for the normal content planning routines or keep fighting SEO battles on old pages. After you’ve updated your website for SEO, it’s sometimes best to just expand it. Invent new pages where you can get everything right from the start. Write some content on the longer side – maybe 1,000 words. Get the right URL, SEO page title, H1 header, etc. Send it some love with internal links from popular pages on your website. Always take advantage of the possibilities right in front of you if you want to make leaps with your search engine visibility. What’s been your experience? 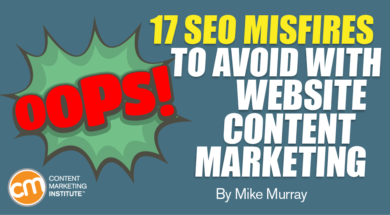 What SEO misfires have you encountered and corrected? Don’t make a misfire in your content marketing training. Plan today to attend Content Marketing World Sept. 4-7. Register today using code BLOG100 to save $100.